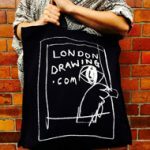 A voucher for London Drawing classes makes a great gift for friends, family or colleagues. Choose from a number of drop-in classes (you can choose the quantity after you click the ‘Buy now’ button), or a one-day workshop, give us the details of the person receiving the gift and the occasion and we will create a personalised voucher to give to the recipient. If you want to buy a voucher for a specific date or for a Drawing Theatre, then please contact us.